(Tilia caroliniana) Texas native linden that grows wild in East and South Central Texas. It grows up to 90 feet in deep, rich soils and has fragrant flowers from April to June. Kin to little leaf linden. NATURAL HABITAT AND PREFERRED SITE: Carolina basswood is native to east Texas and a small area in central Texas but it seems to grow well in a wide variety of soils. Grows natively north and west of San Antonio. 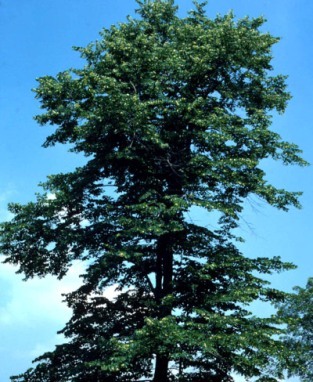 IDENTIFICATION INFORMATION: Carolina basswood is a large tree with an irregular rounded top with large heart-shaped leaves and pleasant fragrance in the spring. The introduced lindens are straight trunked and symmetrical and neat in appearance in most cases. The native Carolina basswood tends to be more irregular in form. They also tend to be multi-trunked and sucker from the base. FLOWERS AND FRUIT: Flowers are suspended from papery bracts that look like leaves. They are small, fragrant, off-white, 5 petaled flowers in drooping clusters. Fruit is a winged hard capsule with 1 or 2 seed called nutlets. BARK: Gray with shallow fissures and flat ridges. FOLIAGE: Alternate, simple, deciduous, heart-shaped leaves with yellow fall color. Leaves have a lopsided or flattened base, pointed tip and toothed margins. Leaves are similar to that of red mulberry, Morus rubra but mulberry leaves are often lobed and symmetrical at the base. CULTURE: Carolina basswood is easy to grow in most soils given moderate to average moisture and requires very little fertilization. Fairly rapid growing. PROBLEMS: Aphids sometimes and some leaf eating insects when the plant is in any kind of stress at all. 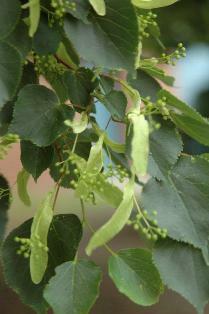 PROPAGATION: Carolina basswood can be grown from seed or stem cuttings taken in late winter. INSIGHT: Wood of Carolina basswood is used for interior woodwork and is great for whittling. Carolina basswood is an excellent tree for providing nectar for bees to make a wonderful honey but there aren’t enough Carolina basswood in Texas anymore to have a significant effect. Need to plant more. Tilia cordata, little leaf linden, is a European tree and well adapted to most of the soils in Texas as long as it is not solid white rock. Its leaves are smaller and silvery on the underside and it generally has a more compact, symmetrical growth. There are some beautiful specimens of little leaf linden at the Collin County Community College in Plano, Texas. Teas made from the flowers are good for digestive problems, insomnia, and nervous attention and even hyperactivity in children.